Alert drivers to slow down and be aware of potentially dangerous parking areas or driveways with KSC Speed Bumps. 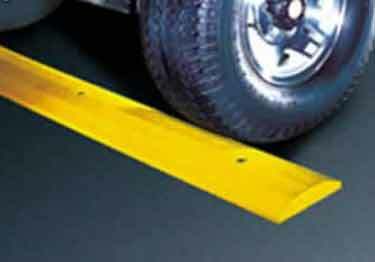 Can an adhesive be applied to the speed bumps ( 2 x 9')to seal to asphalt to prevent water from draining under the speed bump? Have a curved curb, would use this upside down to smooth out the bump, any issues with that? Does it come in black? If now, what paint/treatment would adhere to that surface, or can the yellow be sanded off? they have anything u will ever need for ur garage and more. fun to shop for men. Reflexite Fire & Emergency Medical Service Conspicuity Material, durable, chemical & scratch resistant reflective sheeting.